"If I´m not mistaken, I first heard about the Memorial Maria Luisa through Grandes Espacios magazine. I decided to take part in the contest because of the importance that prizes have in your CV and also because of the money prize. As a contestant and winner of the 1998 Edition, my opinion about the Memorial ML and its organization is a very good one. I go trekking and do some routes by car both by paths and mountain roads. I am a professional photographer specialised on travel and nature. I have taken part or organised 12 exhibitions in my city and others all around Spain. I have published about 150 articles and photos on travels and nature. I have been awarded several photographic prizes. I´ve got a personal website, to publish and circulate my work , included in several web-searchers. The winning slide of the Memorial ML was taken in the Natural Reserve of Muniellos (Asturias) in the autumn. It is a tiny waterfall over a small stone in the river Muniellos. The final result of the water effect was unpredictable but the leaf on the rock caught my eye. I used a camera Nikon F4, with a Nikon zoom lens 80-200. 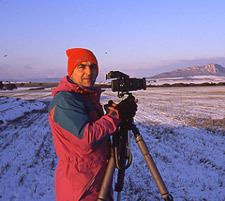 The film was Fuji Velvia and I used a tripod".